Charlie Tahan: I loved Tim Burton movies since I was really little, so I almost couldn’t believe it when I heard I booked it. It was a long audition process. I think from the first time I read for “Victor” til I found out, it was about a year. I had a bunch of callbacks, and met with the casting directors and producers along the way. For a while I didn’t even know that it was for an animated film – I thought it was for a live-action movie because they filmed the auditions. I really couldn’t believe that I got it – I had never done a voice role before, but I was so happy. 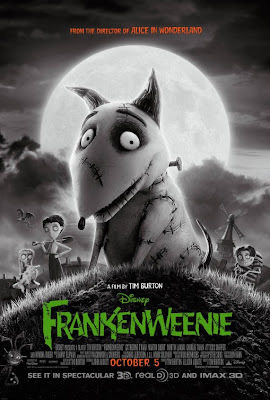 BSR: You were not even alive when the original Frankenweenie short was produced. Had you seen it before making this is film? And presuming you did see it, what if anything did you take from it to inform the character of Victor? What else did you bring to find Victor’s voice? TAHAN: I think I actually did see the original when I was really little; I think we had it on tape. But it was so long ago, and I didn’t watch it again until I found out I booked it. It is a really cool short film. I wouldn’t really say I took anything from it, directly. But I think Victor is sort of based on Tim when he was a kid and Victor is a real, relatable, natural kind of kid. So I just tried to keep Victor very real and natural. I tried to keep my normal voice, and that is what Tim wanted, I think. BSR: For such a young man, you’ve worked on some very big projects with some very big and talented names, and Tim Burton is one of the biggest yet. How was it to work with this legendary filmmaker? TAHAN: Tim Burton was basically like my favorite director while I was growing up! I loved so many of his movies, even when I was really little, so I couldn’t believe I was working on a “Tim Burton Movie!” But when I actually met him, he was so nice, and it was so easy to work with him. He knows exactly what he wants and is very … calm. He is a really nice guy. TAHAN: Hmmm, I’m not sure. My parents always sort of let me watch scary movies. I guess some parents try to “protect” their kids from stuff like that. Maybe they think kids can’t handle it? But my parents always like, talked to me about stuff, and just explained things to me … So scary movies were not too scary to me. I knew they were just movies and I liked being a little scared! And my little sister loves scary movies. I don’t know, I guess it is up to each family, and it depends on the kid, I guess. TAHAN: It is amazing. “Frankenweenie” is such a good movie, and no matter what, I am so proud to be a part of it. I don’t actually read reviews or anything, but I love this movie and I am really proud that I am part of it. TAHAN: In the Woody Allen movie, I only have a small role but it was really cool working on that. The movie with Marion Cotillard? I just had a small part in that too. But I just got to see a bunch of footage and that movie looks amazing. It’s called “Blood Ties” and it looks so good; I can’t wait to see it. I am still filming the movie with Peter Fonda. There is an amazing cast, and we go back to work after the holidays. I can’t wait to see everyone again. I go to public school and they are really good about supporting me while I am working, but it is hard sometimes. I’m working on a movie right now, and I have a teacher on set, but I go back to school just in time for midterms – I hope I am all caught up for school when I go back! I do get to hang out with my friends and stuff… I live in a small town so I get to do normal stuff when I am not filming. How many sheep would you give Frankenweenie?